In this refreshingly honest and open book, Sandra Buechler looks at therapeutic process issues from the standpoint of the human qualities and human resourcefulness that the therapist brings to each clinical encounter. Her concern is with the clinical values that shape the psychoanalytically oriented treatment experience. How, she asks, can one person evoke a range of values--curiosity, hope, kindness, courage, sense of purpose, emotional balance, the ability to bear loss, and integrity--in another person and thereby promote psychological change? For Buechler, these core values, and the emotions that infuse them, are at the heart of the clinical process. They permeate the texture and tone, and shape the content of what therapists say. They provide the framework for formulating and working toward treatment goals and keep the therapist emotionally alive in the face of the often draining vicissitudes of the treatment process. 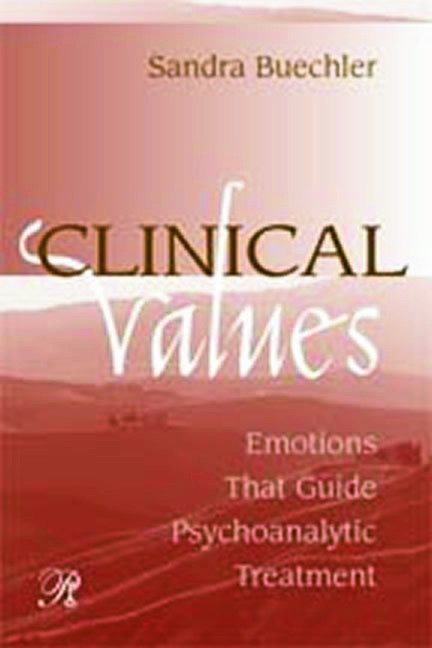 Clinical Values: Emotions That Guide Psychoanalytic Treatment is addressed to therapists young and old. By focusing successively on different emotion-laden values, Buechler shows how one value or another can center the therapist within the session. Taken together, these values function as a clinical compass that provides the therapist with a sense of direction and militates against the all too frequent sense of "flying by the seat of one's pants." Buechler makes clear that the values that guide treatment derive from the full range of the clinician's human experiences, and she is candid in relating the personal experiences--from inside and outside the consulting room--that inform her own matrix of clinical values and her own clinical approach. A compelling record of one gifted therapist's pathway to clinical maturity, Clinical Values has a more general import: It exemplifies the variegated ways in which productive clinical work of any type ultimately revolves around the therapist's ability to make the most of being "all too human." "A subtle, thoughtful, and highly nuanced book that enriches and extends contemporary Interpersonal Theory. Buechler's uniquely poetic sensibility has carried her well beyond the usual considerations of theory and process. For all her meticulous and scholarly presentation, she sees psychoanalysis as less about social engineering or even psychic repair than about poesis, the creation of meaning, and ultimately about passion-for both the work and the patient's emergence. Her book is an original contribution and well worth reading by both practitioners and students of psychoanalysis." Introduction: Manifesting Clinical Ideals. Evoking Curiosity. Inspiring Hope. Kindness in Treatment. Promoting Courage. Manifesting a Sense of Purpose. Creating Emotional Balance. Bearing Loss. Developing Integrity. Emotional Uses of Theory. Sandra Buechler, Ph.D., is a Training and Supervising Analyst at the William Alanson White Institute in New York City. She also supervises at Columbia Presbyterian Medical Center and at the Institute for Contemporary Psychotherapy. A member of the editorial board of Contemporary Psychoanalysis, she is the author of Making a Difference in Patients' Lives: Emotional Experience in the Therapeutic Setting (Analytic Press, 2008). She has written papers on the analyst's experiences of loneliness, loss, joy, and other aspects of the clinician's feelings.